The TF-2 Trident Plain Edge folding knife from SOG features their improved, Arc-Actuator® system for a more secure lock and faster deployment of the blade. Combined with built-in safeties, the Trident is guaranteed to prevent accidental opening or incidental injury. 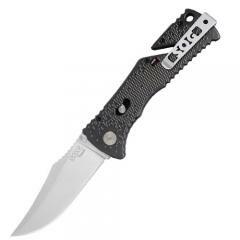 Once deployed, the plain-edged clip-point blade serves as an impressive piercing and slicing tool with its sharp tip and long cutting belly. The unique Groove® feature built into the handle allows for easy cutting of twine or fishing line without opening the knife. A glass-reinforced nylon handle includes Digi-Grip® variable texture for maximum security, keeping it firmly in hands even in wet conditions. The bayonet-style carry clip is reversible, making it equally suitable for left and right-handed users.